35 Jesus said to them, “I am the bread of life; whoever comes to me shall not hunger, and whoever believes in me shall never thirst. 36 But I said to you that you have seen me and yet do not believe. 37 All that the Father gives me will come to me, and whoever comes to me I will never cast out. 38 For I have come down from heaven, not to do my own will but the will of him who sent me. 39 And this is the will of him who sent me, that I should lose nothing of all that he has given me, but raise it up on the last day. 40 For this is the will of my Father, that everyone who looks on the Son and believes in him should have eternal life, and I will raise him up on the last day.” 41 So the Jews grumbled about him, because he said, “I am the bread that came down from heaven.” 42 They said, “Is not this Jesus, the son of Joseph, whose father and mother we know? How does he now say, ‘I have come down from heaven’?” 43 Jesus answered them, “Do not grumble among yourselves. 44 No one can come to me unless the Father who sent me draws him. And I will raise him up on the last day. 45 It is written in the Prophets, ‘And they will all be taught by God.’ Everyone who has heard and learned from the Father comes to me— 46 not that anyone has seen the Father except he who is from God; he has seen the Father. 47 Truly, truly, I say to you, whoever believes has eternal life. 48 I am the bread of life. 49 Your fathers ate the manna in the wilderness, and they died. 50 This is the bread that comes down from heaven, so that one may eat of it and not die. 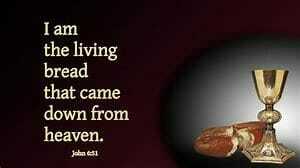 51 I am the living bread that came down from heaven. If anyone eats of this bread, he will live forever. And the bread that I will give for the life of the world is my flesh.” The Gospel of the Lord. Grace, mercy, and peace to you from God, our Father, and the Lord Jesus Christ. Amen. Everyone is going to die. I am. You are. That’s the main problem of human existence. We have a birth date. We have a death date. How long each of us has to live cannot be definitively determined by actuarial tables. Yes, actuaries are brilliant statisticians working for insurance companies. They can talk in statistical probabilities about our lifestyles, our family histories, our environment, and the various subcultures that inhabit this country. But they cannot predict who will be the victim of random acts of violence. They cannot determine the exact day of everyone’s death. They cannot explain the inexplicable, those potentially fatal forces beyond our control. So, then, how will you respond to the undeniable certainty that you are going to die at a time over which, barring your own fatalistic action, you will have no control? What Will You Do About Dying? Most Christians aren’t afraid of death, but many of us are afraid of dying. We don’t want to hurt. The perfect scenario is to die in your sleep and wake up in the Lord’s presence. One day you’re going along fine. Then, with no pain, you go to sleep and wake up there. It sounds lovely, and a few of us get what a friend in Texas calls a first-class ticket. Presumably, business-class is you are only briefly aware, momentarily aware you are dying, and, then, you are gone suddenly. Now contrast that with our Lord’s slow painful death. Contrast that with the horrible deaths suffered by martyrs including most of the apostles and their successors in the first three centuries of the Church. Contrast that with the deaths suffered by present-day martyrs in countries hostile to Christianity. Our culture is pain averse and pretty much death averse. We are afraid of pain. We don’t have to rehearse all the alternatives to Christianity in our midst. Let’s be clear about one thing. They are competitors to Jesus. They offer some other answers to the fear of dying and to death. Most of those alternatives are really smoke and mirrors, earthly distractions to keep us from facing the truth. We are mortals not gods. We need a Savior, and only Jesus can save us. Israel in Egypt wanted to be saved from slavery, but then they hated the deprivation that came with freedom. Many would rather have returned to Egypt than to have to suffer hunger or thirst. How many people turn away from the Savior who can free them, because they are afraid of pain or afraid of the terrifying freedom that comes when you are no longer a slave? How many suffer a kind of living hell on earth, because they are afraid of being set free to be responsible for self? Biological life comes to an end. There is no escaping that fact. But God’s Son Jesus offers everyone eternal life that begins now and goes on forever. He is the only One who brings eternal life. 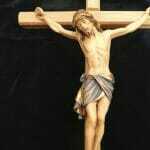 As God in human flesh, Jesus is life. He is the message of life. He is the giver of life. He is the destroyer of the power of death, sin, and evil. He can set everyone free forever. He is life! Many Have Rejected Jesus’ Help Because of Unbelief! When Jesus told His fellow Jews, “I Am the Bread of Life,” they couldn’t handle it. They insisted they knew His parents. He was just another Galilean Jew. So how could He help them? Unbelief is no great virtue. In fact, unbelief is as common as oxygen. Well-educated unbelievers are not somehow smarter, cleverer, or more honest than those who know Jesus as God’s Son in human flesh, the Savior of the world. When I worked at any number of blue collar jobs, most of the people were much wiser in the ways of the world than many of my professors. If you earn advanced degrees you learn research skills and even how to impress your peers with your capacity for iconoclasm and even cynicism. The academy is like the old guild system, where you learn a trade and gain access to employment and advancement in a career. But what is glaringly and sadly missing from much of the academy is the quest for objective Truth. Many, if not most, in the academy do not believe there is such a thing as objective Truth and reject Jesus. You can have multiple degrees in theology and be a total heretic. You can have “The Rev’d. Dr.” in front of your name and still go to hell. If you do not believe Jesus is God in human flesh, the only Savior of the world, you cannot call yourself a Christian. And Jesus cannot save you, because you do not want His help. We can always say No to God, and, sadly, some people do! When you are young or younger and healthy, when no one vibrant and close to you has died, it’s easy to stay in the shallow end of life in this world. Thousands flock each week to feel good activities and even to feel good worship services in which there is a vibe, a happening, an event that appeals to the emotions and the self-interest to have a successful life, a successful marriage, a successful family, or, if you don’t yet have these, to find someone who wants what you want. Now, if you compare that with the description of the Church in Acts 2 and beyond. If you compare that with both the parables and the straight-forward teaching of Jesus in today’s Gospel, it’s hard to make the connections. Suffering, self-denial, the real possibility of martyrdom, and being at odds with the surrounding culture and its false stories and false gods, that’s the Christian faith. Staying with the apostles’ teaching and fellowship, the Lord’s Supper, and the liturgical worship pattern of the Jewish people, that’s the Christian faith. Having a change of heart and mind, the way of daily repentance and the living of one’s Baptism, that’s the Christian faith. When you abandon yourself daily to the mercy of God in Jesus Christ, that’s who we are! Israel in the wilderness wanted bread, and God gave them manna. They still died. The crowd in the wilderness wanted bread, and God in Christ gave them bread and fish. They still died. This life is temporary. Every good gift God gives for this life is temporary. We don’t like to hear that. If the people were going to have hope beyond this life, they needed the Bread of Life from heaven, God in human flesh. They needed Jesus to suffer and die on the cross to save them from sin, death, and the old evil one. We are no less sin-bound, death-bound, or evil-bound than they. We still need a Savior, not once but daily, not only now but always. Jesus offers His flesh for us. The first week on John 6, we learned Jesus is God. Last week, we learned Jesus is Bread, the Living Torah, the Word made flesh. This week we have heard that Jesus is Life, eternal life that begins now. Eternal life begins when you are joined to Jesus’ death and resurrection in Baptism, when you are born from above, born anew, born again by water and the Holy Spirit. This week, Kelly Ruth Fuqua will be confirmed in her baptismal faith, renouncing with us the forces of evil, the devil, and all his empty promises, and confessing with us that the only God is one God in three persons: Father, Son, and Holy Spirit. There is no other name by which we are saved than by Jesus, the only Son of the Father, the One through whom the Holy Spirit has been poured out. Near the end of today’s reading, our Lord Jesus begins to trouble His hearers with the scandal of particularity. He is the only One by whom and through whom we can receive eternal life. He calls to those who are His own to eat His flesh and drink His blood and so to have eternal life in Him. That is a hard saying for those who resist abandoning themselves to God’s mercy in Jesus Christ. But to those who hunger and thirst for real life that death cannot destroy, that sin cannot crush, and that the devil cannot take away, we come empty-handed with joy to His table. We trust that Jesus is the Bread of Life, crucified for our sake, risen from the dead, and that the Holy Spirit, the Lord and Giver of Life, will raise us and all the dead and give to us and all believers in Christ eternal life in indestructible bodies. This is most certainly true, and it changes everything! “Almighty and everlasting God, with boldness and confidence we dare to call you Father: Fulfill and make perfect in our hearts the work of your Holy Spirit, through whom we have become your adopted children, so that we may be found worthy to enter upon the glorious inheritance you have promised to us in Jesus Christ, our Lord; who lives and reigns with you and the Holy Spirit, one God, now and forever. Amen” (The Daily Prayer of the Church, 618). St. Cyril [5th century Patriarch of Alexandria]: “…Let those who have been baptized and tasted the divine grace understand this: if they are sluggish or reluctant about going to church and for long periods of time keep away from the eucharistic gift through Christ, feigning a pernicious reverence by not partaking of him sacramentally, they exclude themselves from eternal life inasmuch as they decline to be enlivened. Thus, their refusal though seeming to be an expression of reverence, is turned into a snare and an offense” (Ancient Christian Commentary on Scripture: John 1-10, 227). St. Ambrose [4th century Bishop of Milan] “And you say that the Son of God is subject by reason of weakness – the Son, to whom the Father brings men and women that he may raise them up in the last day. Does this seem in your eyes to be subjection where the kingdom is prepared for the Father and the Father brings it to the Son? There is no place for perversion of words since the Son gives the kingdom to the Father and none is preferred before him. For as the Father gives to the Son, and the Son, again, to the Father, here are plain proofs of love and regard: seeing that they give to each other that neither he who receives obtains, as it were, what was another’s, nor he that gives loses anything” (232). St. Augustine [late 4th – early 5th century Bishop of Hippo Regius in North Africa]: “From visible and carnal death, the death of the body, we are not [delivered]; we shall die, even as they died. But from spiritual death, which their fathers suffered, we are delivered…Though your sins are daily, at least let them not be deadly. Before you go to the altar attend to the prayer you repeat, ‘Forgive us our debts as we forgive our debtors.’ If you forgive, you are forgiven; approach confidently; it is bread, not poison…None then that eat of this bread shall die” (237). St. Cyril of Alexandria: “Christ therefore gave his own body for the life of all, and again through that body he makes life to dwell in us…For since the life-giving Word of God indwelt in the flesh, he transformed it into his own proper good, that is, life, and by the unspeakable character of this union, coming wholly together with it, rendered it life-giving as he himself is by nature. Wherefore the body of Christ gives life to all who partake of it. For it expels death when it comes to be in dying people, and it removes corruption, perfectly full, in itself, of the Word which abolishes corruption” (238). 1. Do I try to get eternal life out of the people and things of this world that must die or be left? 2. Do I approach the Sacrament of the Altar, my Lord’s own real presence, as nothing vital? 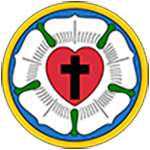 Prepared by Dr. Martin Luther for those who intend to go to the Sacrament. After confession and instruction in the Ten Commandments, the Creed, the Lord’s Prayer, and the Sacraments of Baptism, and the Lord’s Supper, the past may ask, or Christians may ask themselves these questions. We should remember and proclaim His death and the shedding of His blood, as He taught us: “This do, as often as you drink it, in remembrance of Me.” (Luther’s Small Catechism). 1. Pray for every unbaptized child and adult you know and for the child’s parents, too. 2. Pray for your unchurched loved ones and friends. Invite one or more of them to worship. 3. During the summer months (especially fathers! ), bring your household to the services of God’s house. If you are on the road, worship while you are away and bring back the bulletin for Pastor Zumwalt to see. Do this for accountability and to let the pastor see what other congregations are doing. 4. Begin now to make room in your schedule for Sunday School and Bible study at St. Matthew’s this fall. Mark the date for Rally Day on August 26 in your calendar! Sign up for the lunch! 5. Hang a crucifix or cross opposite your pillow so that the last sight you see before turning out the light is your Lord’s cross and the first sight of the new day reminds you to pray.